There has been some pretty good discussion on why there is a change. But wait. Boot partition? Where is that? With the NOOBS system, you simply copy a few files and directories over to the SD card, then boot the card with the Raspberry Pi. There isn't an actual /boot/ directory. Clearly just adding a ssh file to the root directory on the SD card is a fail. Ditto for adding an ssh file to the OS directory. That failed too. Anybody been here before? Since 11.25.2015, how does one enable a headless system accessible via SSH? Note: A previous answer on this issue, Installing Raspbian from NOOBS without display no longer is applicable to the latest version of NOOBS. So no, this question isn't a duplicate of that one. There is no file flavours.json. 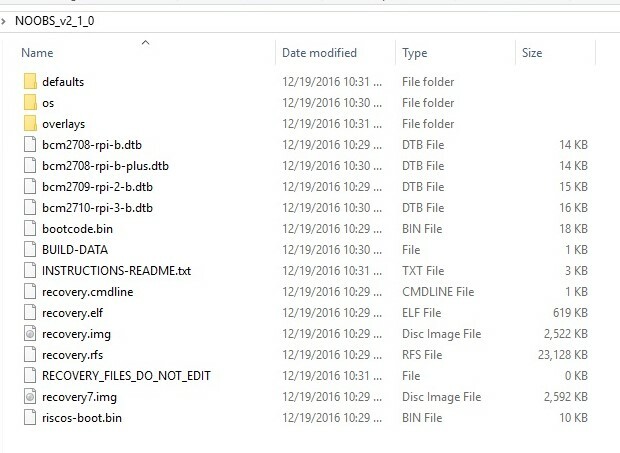 There is no file recovery.cmdline. As I look thru the raspberrypi.org website, I do see this link, currently showing two different compiled images of Raspbian Jessie. Note: there was some considerable discussion of this issue at https://www.raspberrypi.org/forums/viewtopic.php?f=66&t=166984&p=1075797#p1075797, but ultimately, using NOOBS without a keyboard/mouse/monitor really isn't an intended usage case. The Simon Long response really makes more sense. I've downloaded and using NOOBS v2.1.0. After the Pi booted, I just had to find it's IP Address. I did this by logging into my Router to find it. The latest version of NOOBS should look for the ssh file on its Windows-readable partition. Not the answer you're looking for? Browse other questions tagged raspbian ssh noobs setup or ask your own question.